This is a change I didn’t see coming – Blizzard are implementing new, “improved” character skins. 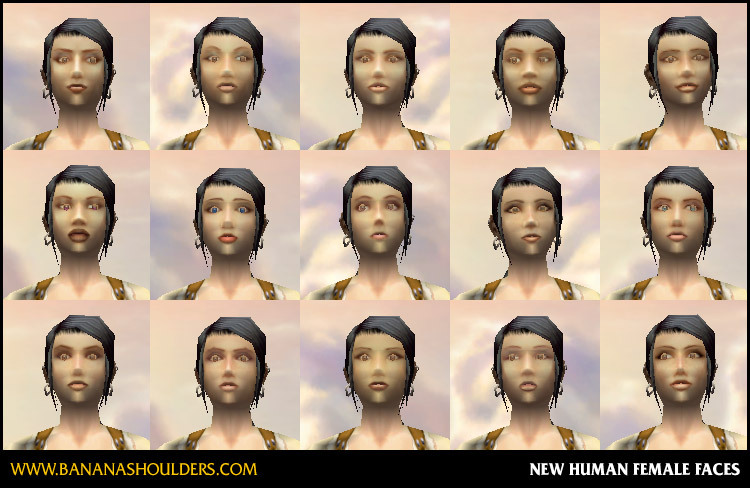 After the jump, screenshots of the new female human, dwarf and gnome faces. Obviously, the eye textures on gnome females are glitched right now. Still, you can see what’s in store. 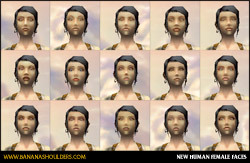 There seem to be some minor changes to night elf female faces, but nothing significant, and it doesn’t seem as though any males, or females of any other race, have been reskinned yet. I’ll keep you informed! Update 1: Added dwarf females. Update 2: Added gnome females. Update 3: Added the Before and After shot. Update 4: LOL JUST KIDDING! says Tigole. The character textures are not changing. We tested impact on patch size if we were to patch new character textures. It was a development experiment. Obviously, we would not change it so gnomes had eyes looking into the back of their heads. Whether or not one credits the explanation of “oh… just testing!” (and I’m not sure I do; the human female textures are awfully accurate and complete for an “experiment”) there’s confirmation that the face changes aren’t here to stay. Which is… kind of a shame. Sailan’s new face was growing on me. I think gnome males were changed …. and to be honest, I am not sure these are improvements, they seem buggy to me. This is a pretty dangerous thing to be playing with. I remember the last time they adjusted the appearance of human females and there was a huge outcry. 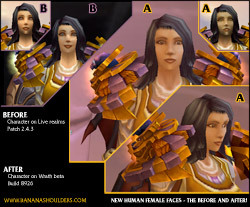 People get attached to how their character looks, and hate having their character’s face changed on them. I am way iffy about these. I can’t even find a remotely close approximation to what my human rogue’s face looks like. I’m hoping these are buggy. Something about the eyes looks very strange. Oh god why? Where are all the cute gnome faces? I’m gonna go cry now. I almost peed my pants looking at those Gnome faces. Fate worse then punting for sure. I was so glad to find out it’s not permanent. Tauren females look awful right now to the point that I really can’t play her.